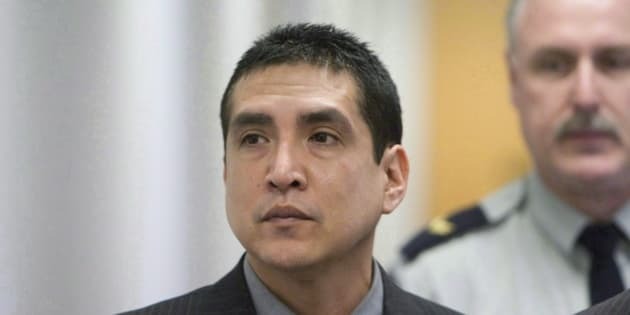 VANCOUVER — A former RCMP officer who was involved in Robert Dziekanski's death colluded with his colleagues to lie about what happened — first to homicide investigators and then again when the Mounties appeared before a public inquiry, a Crown prosecutor alleged Monday. Former corporal Benjamin (Monty) Robinson was among four officers who went to Vancouver's airport the night Dziekanski was stunned with a Taser and died in October 2007. The officers were forced to explain their actions at a public inquiry in 2009, and all four were later charged with perjury for their testimony. The officers were called to the airport in the early morning of Oct. 14, 2007, after Dziekanski, a Polish immigrant who spoke no English and been at the airport for nearly 10 hours, started throwing furniture in the international arrivals area. He was stunned multiple times with a Taser and died on the airport floor. About a month later, an amateur video was released that appeared to contradict official RCMP accounts of what happened. The video fuelled public outrage over the actions of the officers and sparked a national debate about the use of Tasers, prompting a public inquiry to examine both issues. The Crown's theory is that the four officers met at some point before speaking with homicide investigators, to concoct a story that would support their use of force. The Crown further alleges the officers lied to the public inquiry to explain apparent discrepancies between their initial accounts to investigators and what could be seen later on video. "We anticipate arguing that the only logical inference, the only reasonable inference, is that the officers met to discuss their testimony, including how to reconcile their statements (to homicide investigators) with the video,'' Crown counsel Scott Fenton told a judge, who is hearing the case without a jury. Robinson pleaded not guilty at the start of proceedings Monday. His trial will mark the second time the Crown has tried to prove its theory that the officers colluded. Another officer, Const. Bill Bentley, stood trial last year but was acquitted when a judge concluded there were other explanations for what he told the inquiry. The Crown is appealing. The Crown says the officers' initial statements and notes contain similar errors when compared with the video. For example, they initially claimed two officers wrestled Dziekanski to the ground, even though the video shows him falling on his own after the first Taser jolt. The only conclusion, the Crown argues, is that the officers colluded before giving those accounts. However, prosecutors have not said precisely when or where the officers could have met in the hours between the time Dziekanski died and when they spoke to homicide investigators. The Crown also plans to call the spouse of Bentley's cousin, who is expected to say the officers met at her house in February 2009. While the woman was not in the room for the alleged meeting, the Crown says they must have been planning their testimony ahead of the inquiry. The woman, who is expected to testify later this week, only came forward after Bentley's acquittal and so did not appear at his trial. Robinson, now 44, left the RCMP in 2012. Robinson was behind the wheel in October 2008 when his vehicle struck and killed a 21-year-old motorcyclist in Delta, south of Vancouver. A judge concluded Robinson had used his RCMP training in an attempt to fend off accusations of impaired driving. He was sentenced to a conditional sentence of 12 months. Const. Kwesi Millington, who fired the Taser, is scheduled to stand trial beginning next week. Const. Gerry Rundel was also scheduled to stand trial this fall, but the case was delayed at the request of the Crown and isn't expected to be heard until next year. The Crown's appeal of Bentley's acquittal is scheduled to be heard in February.